And did I mention the full-featured, root-enhanced app is completely free with no paid version in sight? As in, even the previously paid (Theft-Aware used to cost 10EUR) features. Avast Mobile Security is stunning not only in terms of functionality, but also in its design and usability. The app's interface is extremely polished, and handles Avast's myriad of features with ease, avoiding a cluttered feeling, and walking users through each feature gently, with full explanations of just what you're getting into. 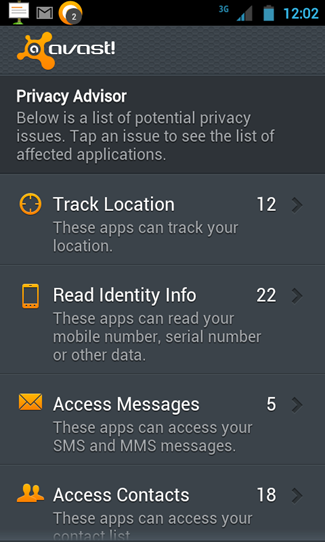 Apps with as long a list of features as Avast often feel too busy, and features sometimes aren't exactly practical. This is not the case with Avast. Each and every feature Avast offers is practical, sensible, and most importantly functional. My only complaints with Avast are minor and really don't detract from its functionality at all. If you haven't gotten the picture yet, Avast does just about everything you could ever need a security app to do. That being said, it will be easiest to discuss each feature separately, in order of their appearance. 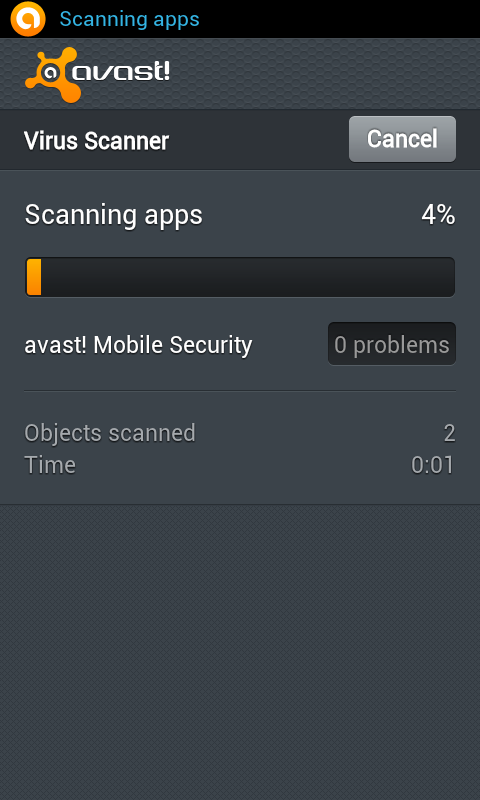 First up is Avast's Virus Scanner. 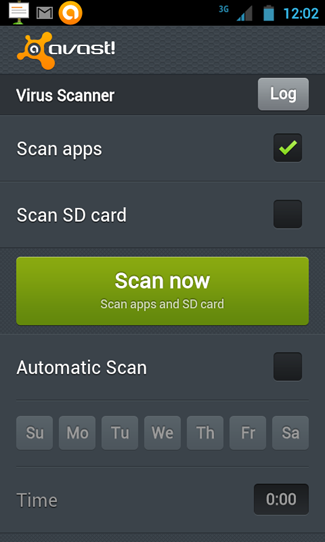 This feature is what you would expect, scanning apps and memory contents for viruses or other malware. For added convenience, users can schedule scans according to days of the week and specific time frames. 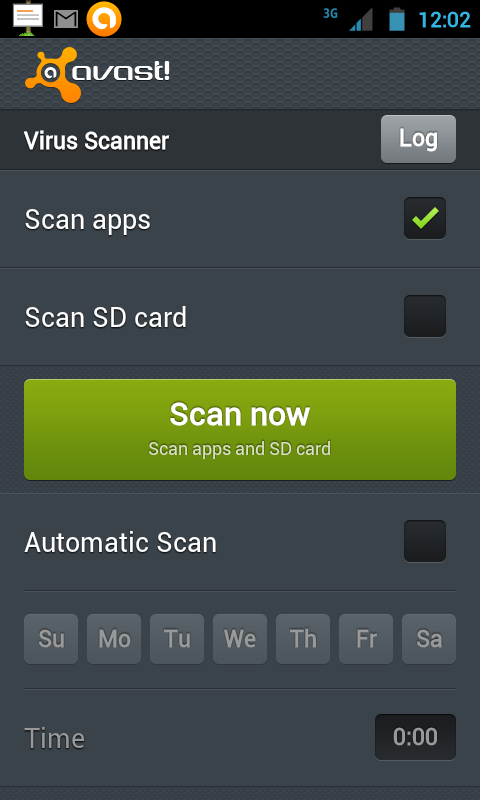 The scanner looks through apps and SD card contents, to make sure you're safe from malware. Interestingly, users can schedule virus scans. Of course, as a lot of us know, most new Android malware is only detected after it does some damage and oftentimes by the time virus definitions are updated, the malware is already long gone from the Market. Therefore, we won't put too much weight on the Virus Scanner - there are features in Avast that are way cooler and more useful. Next is Avast's Privacy Advisor. This tool tells users which apps have access to which data, essentially organizing installed applications according to individual permissions. Avast includes a short description of each permission, making it easy for users to see exactly what each app can look at. 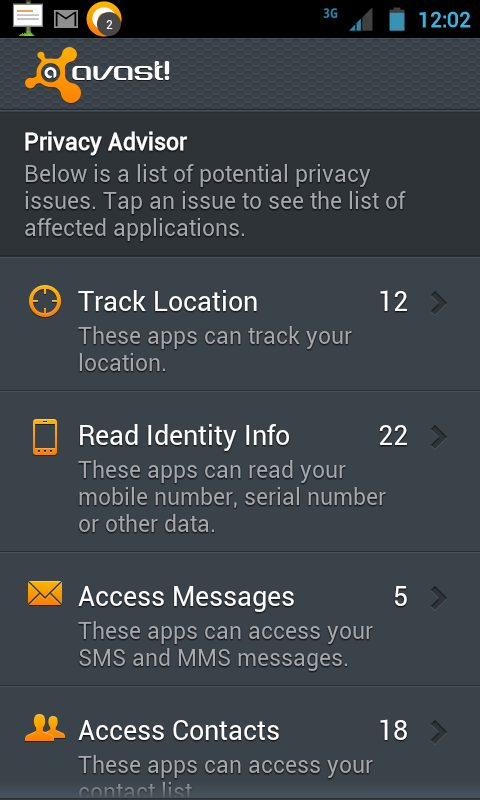 As I'll discuss later, some of these permissions can be blocked using Avast's handy Firewall tool. 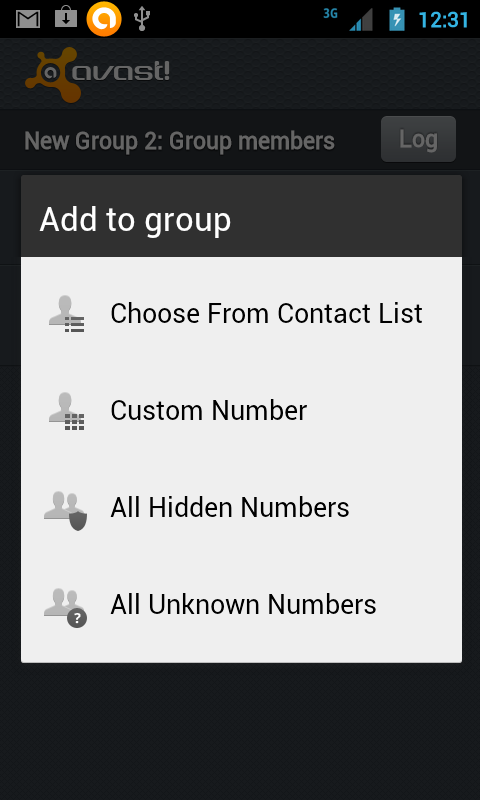 Considering what a close eye users often keep on app permissions, this feature is extremely handy. Avast's Application Management tool is a relatively simple task manager, but brings Avast's sleek UI and intuitive functionality to an otherwise run-of-the-mill feature. 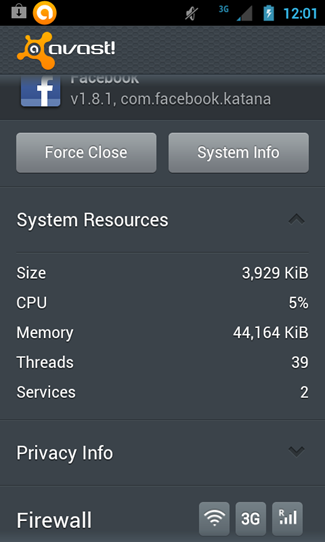 The App Management tool lists all running apps, and allows users to organize the list by size, memory, CPU usage, and a handful of other categories. 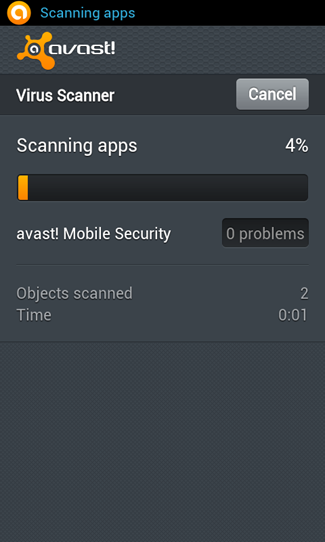 When a user selects an app, Avast brings up a screen just like the one found in Android's native app management settings, with the added functionality of Avast's firewall options (more on that later). Adding subtle redundancies like these gives Avast a more cohesive feel, without making things feel cluttered or bogged down with unnecessary elements. 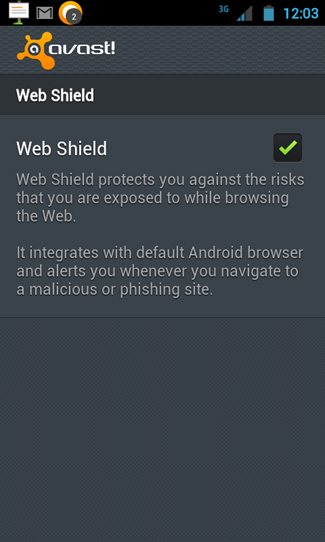 Web Shield is an excessively simple tool, controlled by just one check box, which actively protects users from online threats including phishing websites, malware, etc. This is a great idea, and since it only works with the default Android browser, users of aftermarket browsers, such as Dolphin, Firefox, or Opera, probably won't need to bother with this tool at all. Personally, I have never run into a malware issue while browsing the web, so I'm not exactly sure how often this feature comes into play, but I suppose it's comforting to know that the protection is there. 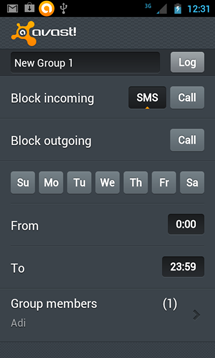 Avast also features call and SMS filters, meaning users can block incoming (and outgoing) calls and text messages according to contacts, groups, times, and days of the week, making it incredibly easy and intuitive to prevent unwanted messages or calls from being received or transmitted. This doesn't feel so much like a security option, as much as a feature thrown in for convenience. 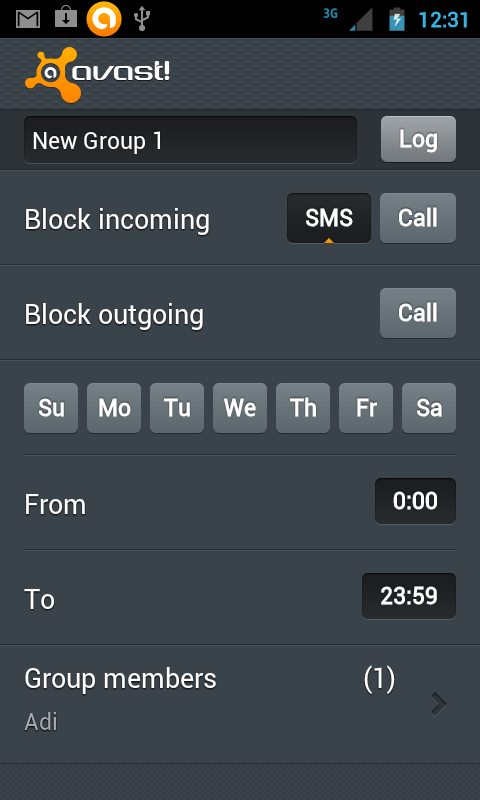 That being said, it's more sophisticated than many of the call/SMS blocker apps out there, functions perfectly, and is – in my opinion – a nice touch. Remember the Firewall feature I mentioned earlier? 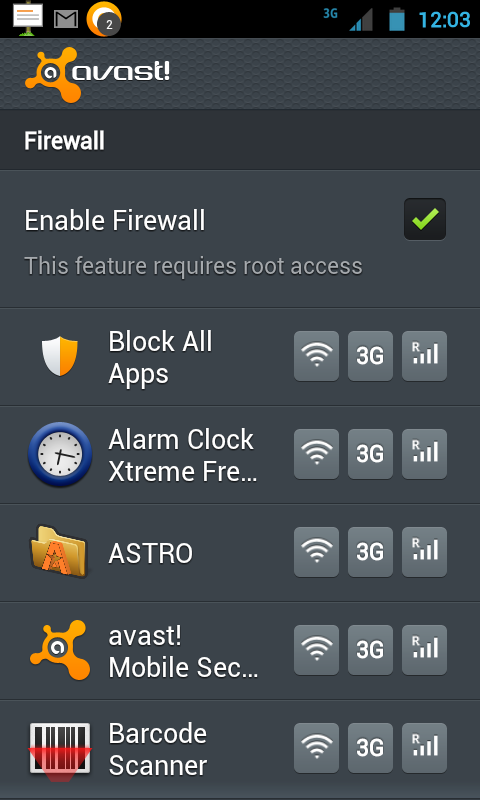 Essentially, Avast's Firewall allows users to block certain apps from doing certain things, namely Wi-Fi access, 3G access, and roaming data access. This feature requires root, but can save a lot of data if you've got apps that like to eat up a lot of bandwidth. Firewall features for root users aren't new to Android - in fact, we've been enjoying them ever since DroidWall came to the Market. 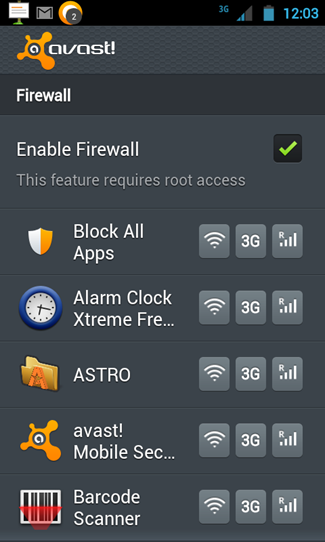 However, DroidWall doesn't include roaming blocking features, and if you decide to go with Avast anyway for some of its other features, you might as well utilize the Firewall and consolidate several apps into one. Avast's Anti-Theft functionality (the real meat of any security app, in my opinion) is almost as sophisticated as you'd expect after using the rest of Avast's features. If you're already familiar with Theft Aware, you'll recognize it immediately, albeit rebranded and much prettier. The anti-theft protection is divided into two sections – basic settings and advanced settings. Basic settings essentially allows users to enter their name, choose a password (for use when accessing the app itself), and remote control options (which is basically a list of "friend" numbers which can control your device via SMS in case of loss or theft). The more practical aspects of Avast's protection are in the advanced settings, however. 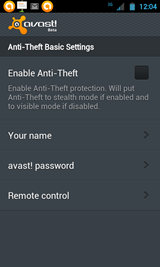 Avast has included many features in their anti-theft protection that I've been looking for in other apps for a while – namely, users can force a data connection (if rooted), and save Avast's settings in case of a data wipe. 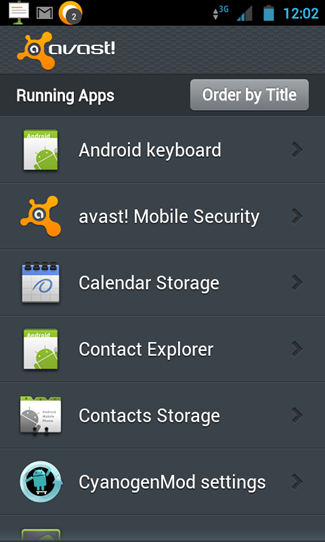 First off, Avast offers a ton of options for when your device falls into the wrong hands. Users can set a variety of "protection behaviors" which will be triggered upon SIM card change, or when the device is marked as "lost." 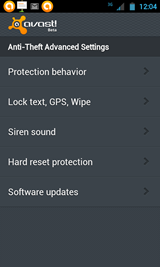 These include some fairly standard features like lock and siren, but Avast has added some new (and refreshing features) including forced data connection, and the ability to deny a thief access to USB debugging, program manager, and phone settings, which honestly seem a lot more practical than the basic protection behaviors found in other apps. 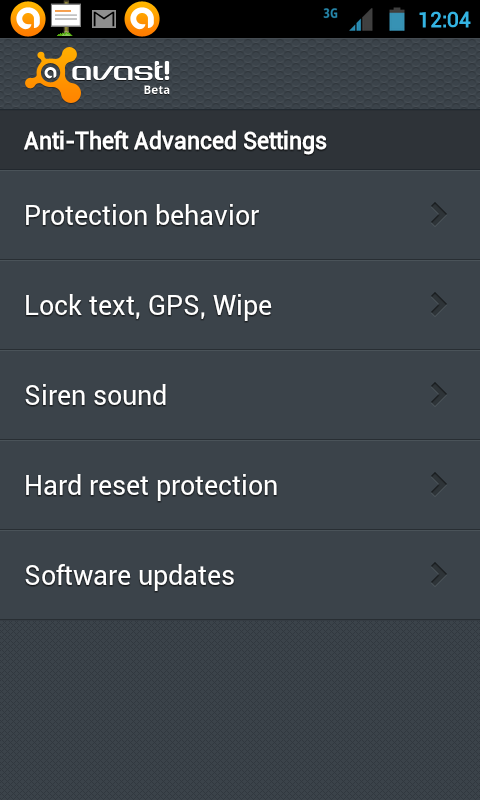 Anti-Theft's advanced settings menu includes an option to check for updates, which could be confusing. However, it's there because Anti-Theft, in fact, is a separate module (you can uninstall Avast and keep just Anti-Theft if you want), and updates to it are delivered independently of the main app. Theft Aware users will recognize this behavior from the good old days, as the TA Market app was just an installer. An extra handy feature, when installing updates, is the immediate option to install to root, essentially making Avast a system app and preventing it from being deleted or uninstalled. As you may remember from previous security reviews, this is a highly sought-after feature which certainly inspires confidence in an anti-theft solution. The one (and only) complaint I have with Avast's anti-theft protection is that it relies solely on SMS commands, and has no online interface at the moment. That being said, Avast demoed the online interface to Artem privately in Prague, and assured us that it will be added in "early 2012," so the already sophisticated protection will soon be even closer to perfection. 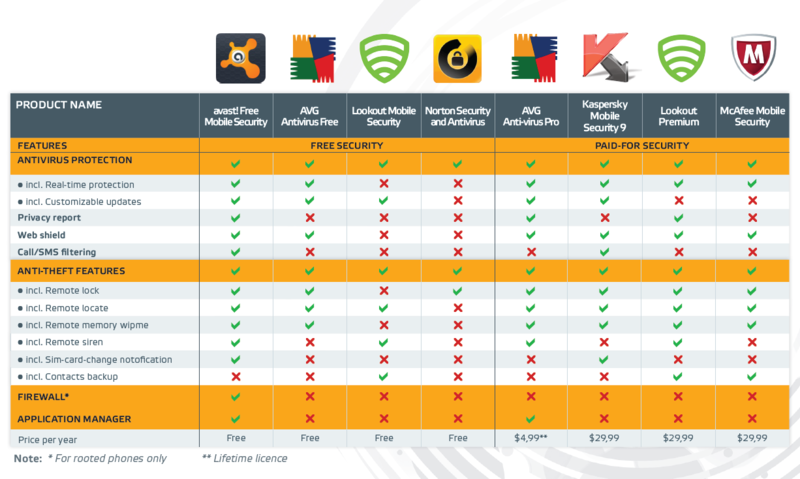 Overall, Avast is an incredibly strong contender among mobile security apps. The fact that it's free is a huge plus, and serves as the icing on the cake. All of Avast's features seem to work perfectly, and are simply polished, intuitive, and well thought-out. Besides the fact that we don't (yet) have an online interface to control Avast, I have just one other minor complaint, which is that Avast asks for my PIN way too often, even asking me to re-enter the pass code while navigating within the app. I suppose in the end this adds a marginal amount of security, but when using the app, it can be a pain. 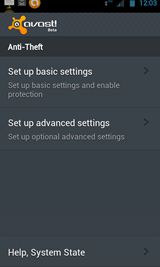 The main settings menu also allows users to set options related to automatic software updates. At first, I was confused about them, but Avast clarified that they're actually not software updates but rather virus definition updates, and the wording will be refined in a future update. Again, these are only very minor complaints. I honestly can't find much to complain about in terms of functionality or user experience, meaning this app is truly a winner. How does it stack up to other security apps? I think Avast is close to being beyond comparison, really. Avast is probably the most well-rounded security app I've used yet, and shows no signs of slowing down. Considering it's completely free, I would definitely recommend clicking through the Market link below and start protecting your device with one of the most comprehensive, complete, and functional apps you'll ever see.